AUD/NZD is currently trading around 1.0422 marks. Pair made intraday high at 1.0425 and low at 1.0400 marks. Intraday bias remains neutral till the time pair holds key resistance around 1.0432 mark. 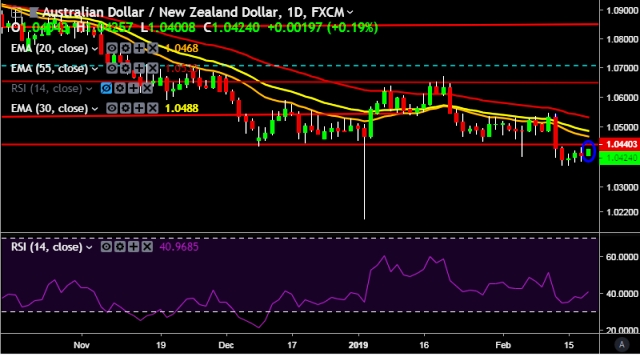 A sustained close above 1.0432 will drag the parity higher towards key resistances around 1.0540/1.0570/1.0590/1.0634/1.0712 levels respectively. Alternatively, a daily close below 1.0390 will take the parity down towards key supports around 1.0365/1.0333/1.0237 marks respectively. Australia Q4 2018 wage price index yy stays flat at 2.3 % (forecast 2.3 %) vs previous 2.3 %. Australia Q4 2018 wage price index qq decrease to 0.5 % (forecast 0.6 %) vs previous 0.6 %. Australia's S&P/ASX 200 index up 0.06 pct at 6,110.80 points in early trade.